There aren’t a lot of African gamers, as would be expected due to the general lack of access to gaming technology and platforms in Africa, relative to other parts of the world. There are even fewer game developers on the continent. Due to being a gamer myself, I like to keep track of this as much as possible, and it’s always fun to announce a new one. iWarrior is an iPhone game (iTunes link), created by the cross-Afrian team of Kenyan Wesley Kirinya and Ghanaian Eyram Tawia of Leti Games. It’s a unique top-down shooter game that utilizes the iPhone’s inbuilt accelerometer to both move and shoot. 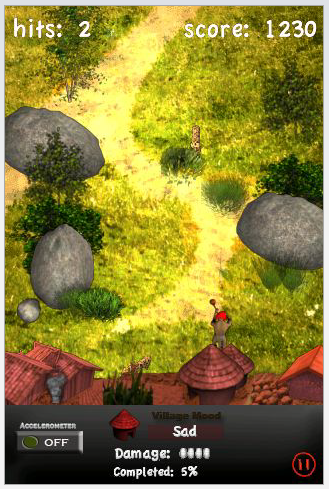 Your goal: protect your village, livestock and garden from the incoming marauding animals. It’s a great first-effort from the team, and I believe it’s the first game created by a team in Africa. This itself is a much more difficult task than what many might expect. Just to get an iTunes account and a way to be be paid for your application is a challenge due to Apple’s inbuilt prejudice against Africa (they’re not alone in this, as many other platforms, like PayPal’s or Google Checkout’s are the same). That seems like a dramatic statement to make, but I ask you to stay your judgment until you’ve walked in the shoes of an African programmer. iWarrior also allows you to play your own music while playing the game. This might seem small, but it’s something a lot of game maker’s overlook, and it’s a lot more fun than listening to the same repetitious in-game music. The game costs $2.99, which is a little steep for new games on the iPhone. For many reasons the costs of most applications (games or otherwise) on the App Store have been driven to about 99cents. So, it takes either a really big name or an app that has hard to replicate features in order to break past $1.99 and sell a lot. In the team’s defense, it’s difficult for them to download paid games to test and see if they compare to their own prior to putting it on the market (again, due to them being in Africa). The graphics are okay. I’m a stickler on this type of thing though, and I go for either over-the-top quality or simplicity. 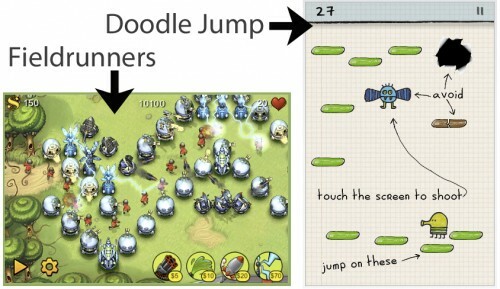 Examples of this is comparing Fieldrunners to Doodle Jump, both excellent graphically, yet with completely different aesthetics. So, I’m going to ding the team on this part of the game. This, after a lengthy discussion in Ghana with Eyram over the difficulties of finding quality digital artists. It’s not an easy thing to do, the best designers aren’t digitally literate, with a few exceptions. So, you get great sketching and painting, but few can put that into vector graphics, 3d or even Photoshop. Though the challenge is high, we live in a digitally connected world where top quality digital artists from Asia and Eastern Europe can be found to do the work at acceptable rates. There are other options, and a game can be made or broken on looks alone. iWarrior is an excellent first game on the iPhone platform from two highly talented and creative African game developers. I expect that there will be a lot of good games, and other applications, coming from this team over time – both on the iPhone and other platforms. It’s a game to be proud of and one that I hope a lot of others will buy.